Paradise on Earth. It’s hard to describe such incredible island beauty with its emerald and sapphire blue waters and white sand beaches. Unforgettable Trips’ owner/founder Laurel Brunvoll is especially passionate about the South Pacific. She is a Certified Tahiti Specialist and has personally visited the islands of Tahiti. She loves helping clients fulfill their travel dreams and crafting the perfect honeymoon, anniversary or family vacation to this tropical Eden. What’s so special about Tahiti? 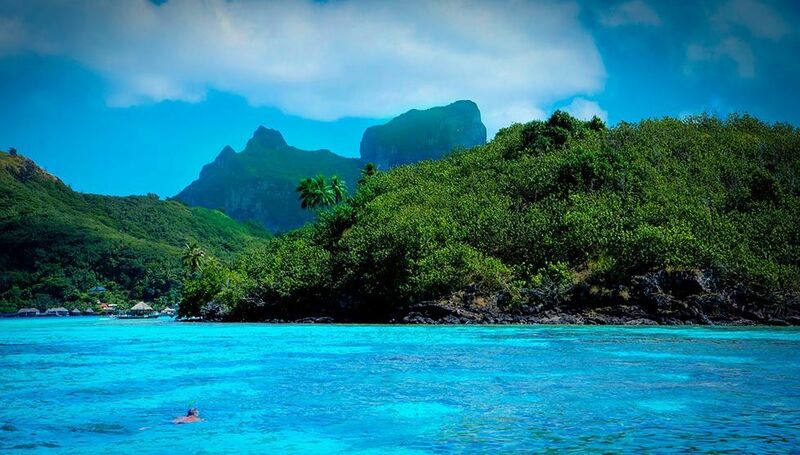 People are drawn to Tahiti for more than just its crystal clear waters, lush island mountains and soft sand beaches. In addition to staying at world-renowned overwater bungalows, visitors also encounter an explosion of Polynesian history and culture. Music, dance and flowers pay important roles in rituals. Large, open-air ancient stone structures can still be found while touring many of the 118 islands on wheels, horseback, 4×4 safari rides, or guided hiking tours. Enjoy a picnic set up for you on your own private beach. Swim with sharks, turtles and barracuda. Whale watching season is July through October, when humpback whales migrate to and from Antarctic waters to breed and give birth. Visit in July for the annual Heiva festival for a display of Polynesian activities including crafts, ancient sports, and traditional, elaborate dances. If you like golf, spas, cruises, helicopter tours, or warm-weather water sports, you can find it in Tahiti. How far away is Tahiti? It’s closer than you think! Daily non-stop flights from Los Angeles LAX airport take under 8 hours, and it’s just 4 hours from Hawaii. Tahiti is halfway between California and Australia, and is in the same time zone as Hawaii, 2-3 hours behind Pacific Standard Time. Tahiti is on the same side of the International Date Line as North America. Not as much as you might think. Of course, like anywhere, you can travel economically, you can splurge, or find balance with something in between. Believe it or not, traveling to Tahiti can be comparable in cost to Caribbean travel. We recently found a great deal for one of our clients when 7 nights plus round-trip airfare from LA cost $1700 LESS than 6 nights at a comparable resort in St. Lucia, without airfare. Where else can I go in the South Pacific? Fiji is a popular destination for honeymooners, couples who are celebrating, and especially those already visiting Australia or New Zealand. Accommodations are often more private and romantic bungalows, and there are fewer big chain hotels. Fiji is a 4-hour flight from Australia, and a 2-hour flight from New Zealand. It is on the other side of the International Dateline from North America. Other popular destinations that Unforgettable Trips can help with are the Cook Islands, Samoa and American Samoa, Vanuatu, and Easter Island. Give us a call and let us help you decide what’s best for you!